This website is maintained for copyright about my design. Pictures show the research and development from 1996 to 2008 activity years. This website is a reference for collectors about technical information for use and maintenance. Questo sito è attivo per la conservazione del copyright dei miei progetti. Le fotografie mostrano le ricerche e lo sviluppo negli anni di attività dal 1996 al 2008. Poi la produzione è terminata. Il sito serve da riferimento per i collezionisti per informazioni tecniche di uso e manutenzione. 2. exclusive 4 Alnico magnets anti-skating device. First key point is the unipivot bearing. Unipivot arm has only one bearing point for all displacement planes, instead the cardan bearings arm has separated bearings for the horizontal and vertical planes. In cardan bearings some clearance is required to have a low friction, clearance is increased by wear, and this gives beating. In unipivot bearing the mass of the arm stands on the pivot, closing the clearance to zero between the pivot and the conical cavity in which the pivot rests. So clearance is self adjusted to zero by the arm weight regardless the wear, and is constant in time. The stylus, following the groove contours, is a vibrations source, these waves see the clearance as a boundary which stops them, the effect is like a wall reflecting the waves back. Zero clearance unipivot bearing is a pathway though which waves are discharged away from the arm, this makes the sound cleaner. By this reason pivot matter has a key role in sound quality. In other arms very hard matters are employed, as tungsten (wolframium), ruby, diamond or ceramic, but the harmonic steel, just a gramophone needle, is my favourite pivot. A true unipivot arm can roll around the stylus-pivot axis, in some unipivot arms this is avoided adding friction surfaces, or damping fluids are employed to keep the arm more stable. The best way to make a stable unipivot arm is concentrating the mass around the stylus-pivot axis, this makes the arm self-stabilizing without adding mechanical linkages. My research demonstrates that mechanical linkages reduce sound quality and dynamic range. So CM 1 arm rests on two points only: stylus and pivot. CM 1 arm has a not inverted unipivot, this makes possible to put just a drop only of silicon grease for lubrication purpose, more grease makes the sound dead. Second key point is my anti-skating method. 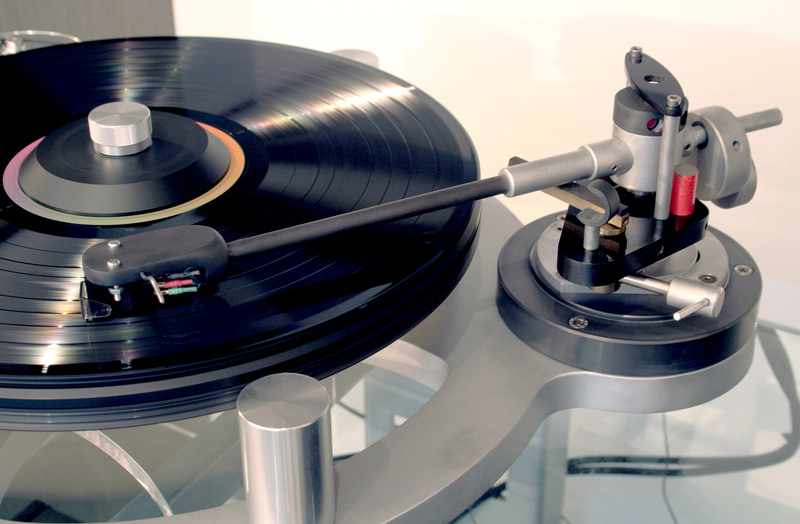 To obtain a good tracking it should be desirable to keep the stylus pressure balanced on the two walls of the record groove, and this must happen along the entire vinyl surface. Skate force pulls the arm toward the disc centre. Without anti-skating device after some time the cantilever is seen deflected toward the outer rim of the disc. Stylus pressure is unbalanced since the beginning, but the effect is noticed later, because the rubber joint and the steel wire holding the cantilever can resist some time, then the materials fatigue give a collapse. Then the stylus is not worn symmetrically. Some audiophiles think that anti-skating is necessary at low stylus pressure, but at higher pressure it is unnecessary. Skate force increases depending on the stylus pressure. Cantilever deflection is noticed earlier in high compliance cartridges, instead low compliance cartridges resist longer before a deflection is detected, but it is matter of time, then the fatigue shows all its effect and the collapse happens. So life of the cartridges are shorter, and there is more distortion forever. Anti-skating device is advisable, but without adding mechanical linkages. These have a worsening effect reducing the dynamic range. So magnetic anti-skating is my choice. The only unipivot arm with magnetic anti-skating made previously is Decca International Arm. Kmal arm has unipivot bearing and a magnet, but it is not adjustable. Then there is another important point: skate force is not constant, it is decreasing toward the centre of the disc. Generally this effect is not considered, because many arms have too much friction to show this effect, while my arm can show this adjusting magnets to give a constant force. For demonstrating this an uncut disc is necessary. Adjust anti-skating force so that arm remains still, just in the middle of the disc. The two side magnets at the same height give the same force. Then put the arm at the beginning of the disc, it goes toward the middle. This means that from beginning to middle the force is scarce. Then put the arm at the end of the disc, the arm goes to the middle. This means that force is in excess. So it is easy understand that antiskating should be adjusted to reduce the force toward the disc centre. When the adjustment of my arm is completed, the inner magnet is lower, and gives less force than the outer magnet. The standard anti-skating devices cannot be adjusted in this way, and this happens with Decca International Arm, too. Stylus pressure on the two groove-walls can be balanced only at one point of the disc, this means that in all other points the pressure is not balanced. So the mis-tracking occurs, and this means noticeable distortion, and unstable stereo image, and in mono recordings the sound does not stay in the middle between the two speakers, but dances wildly. My anti-skating displacement (copyrighted) employs 4 Alnico magnets. Neodymium magnets are stronger and smaller, but force field is not smooth as Alnico magnets. Morsiani Arm has the first and unique anti-skating device allowing to adjust magnets decreasing anti-skating force toward the disc centre with the same ratio as skating force decreases. Stylus pressure on the two groove walls can be balanced from the beginning to the end of the disc, when arm is adjusted following my method. Mono tracks are played in the middle of the speakers, this avoids the need of a mono cartridge for mono discs. Then the stereo image is stable and focused, details are heard as never previously heard by me, dynamic range is uncompressed. 2. esclusivo anti-skating con 4 magneti Alnico. Il primo punto chiave è l’articolazione unipivot. Il braccio unipivot ha solo un punto di articolazione per tutti i piani di movimento, invece il braccio con l’articolazione cardanica ha articolazioni separate, per il piano orizzontale e per il piano verticale. Nei bracci cardanici è richiesta una tolleranza per avere un attrito ridotto, la tolleranza aumenta con l’usura, e questo genera problemi di sbattimento. Nei bracci unipivot la massa del braccio appoggia sul pivot, riducendo a zero la tolleranza fra pivot e la cavità conica in cui il pivot appoggia. Perciò la tolleranza si mantiene a zero per effetto del peso del braccio nonostante l’usura, e si mantiene costante nel tempo. La puntina, seguendo i contorni del solco, è una sorgente di vibrazioni, queste onde vedono la tolleranza come un confine che non ne consente il passaggio, l’effetto è come una parete che le riflette indietro. Invece la tolleranza a zero rappresenta un punto di continuità attraverso la quale le vibrazioni sono scaricate via dal braccio, e questo rende il suono più pulito. Per questa ragione il materiale del pivot ha un ruolo chiave nella qualità del suono. In altri bracci sono impiegati materiali molto duri, come il tungsteno (wolframio), il rubino, il diamante o la ceramica, ma l’acciaio armonico è il mio pivot preferito. Un vero braccio unipivot può rollare intorno all’asse puntina-pivot; in alcuni bracci unipivot vengono aggiunte superfici di attrito che impediscono il rollio, oppure impiegando fluidi smorzanti per mantenere più stabile il braccio. Il miglior modo di rendere un braccio stabile è di concentrare la massa attorno all’asse puntina-pivot, e trovare il baricentro adatto, questo rende il braccio auto-stabilizzante, senza aggiungere vincoli meccanici. Le mie ricerche hanno dimostrato che i vincoli meccanici riducono la qualità sonora e la dinamica. Il braccio CM 1 appoggia in soli due punti: la puntina e il pivot. Il mio braccio ha il pivot non invertito, in questo modo la cavità conica in cui il pivot appoggia è rivolta verso il basso. Questo permette di mettere il grasso siliconico a scopo di lubrificazione. La dimensione della cavità è volutamente piccola per accoglierne un quantitativo adeguato, da prove fatte sui prototipi, metterne in più rende il suono smorto. Per ottenere un buon tracciamento è necessario che la pressione della puntina sia bilanciata sulle due pareti del solco, e questo deve avvenire lungo tutto il disco. Mettendo il disco test non inciso si vede che il braccio, senza dispositivo anti-skating, scivola verso il centro del disco. Nel disco inciso il solco trattiene la puntina, ma la pressione di appoggio sui due lati del solco non è bilanciata. La conseguenza è che, dopo qualche tempo, si vede il cantilever deflesso verso l’esterno del disco. L’elastomero e il filo di acciaio che reggono il cantilever oppongono resistenza, ma con il passare del tempo l’affaticamento dei materiali si evidenzia con un cedimento. E la puntina viene usurata in modo asimmetrico. Tutto questo accorcia la vita utile della testina, ma lo si vede in seguito, invece la distorsione causata dal cattivo tracciamento c’è da subito. Alcuni pensano che l’anti-skating serva solo con una bassa pressione della puntina e che a pressioni maggiori non sia necessario. La forza di pattinamento che trascina il braccio verso il centro del disco aumenta in modo direttamente proporzionale alla pressione della puntina. La deflessione del cantilever si nota prima nelle testine ad alta cedevolezza, invece nelle testine a minore cedevolezza occorre qualche tempo prima che la deflessione si noti, ma è solo questione di tempo, poi l’affaticamento dei materiali mostra i suoi effetti ed avviene il cedimento. Perciò l’antiskating è consigliabile, ma dovrebbe essere realizzato senza aggiungere vincoli meccanici. Questi hanno per effetto la riduzione della dinamica, secondo la mia esperienza. Perciò ho adottato un sistema magnetico. L’unico esempio di braccio unipivot con anti-skating magnetico regolabile precedente al mio è il Decca International Arm. Il braccio Kmal era unipivot e aveva un magnete, ma non regolabile. C’è un altro punto importante: la forza di pattinamento non è costante, ma decresce verso il centro del disco. Generalmente questo effetto non è considerato, o perché nell’articolazione c’è troppo attrito per evidenziare l’effetto, oppure non è possibile eliminare del tutto l’antiskating. Per la dimostrazione occorre un braccio sufficientemente scorrevole e dotato di antiskating a forza costante. Un antiskating a filo e contrappeso fa questo perché il contrappeso, scorrendo verticalmente, applica una forza costante al braccio indipendentemente dalla sua posizione. Prima si mette il disco liscio. Poi si regola l’anti-skating in modo che il braccio stia fermo al centro del disco. Mettendo il braccio all’inizio del disco, il braccio va al centro, il che significa che la forza prodotta dall’anti-skating all’inizio del disco è scarsa. Poi si mette il braccio alla fine del disco, il braccio va al centro, il che significa che la forza verso la fine del disco è eccessiva. Per cui si vede che c’è un solo punto in cui l’antiskating è giusto. Da questa osservazione si deduce che l’ideale sarebbe un anti-skating regolabile in modo da ridurre la sua forza via via verso il centro del disco. Gli anti-skating a filo e contrappeso non possono essere regolati in questo modo, e nemmeno gli antiskating magnetici o a molla. Alcuni anti-skating magnetici e a molla hanno la forza decrescente, ma dispongono sempre di una sola manopola di regolazione, per cui se si aumenta o diminuisce la forza all’inizio, in pari percentuale aumenta o diminuisce alla fine, perciò non è possibile variare la differenza di forza fra inizio e fine. Il mio anti-skating impiega 4 magneti Alnico. I punti di regolazione indipendenti fra di loro sono 3 (soggetto a copyright). I magneti al neodimio sono più piccoli e con maggior forza, ma il campo di forza non è uniforme come con i magneti Alnico. Il mio sistema permette una regolazione molto accurata. Quando la regolazione del mio braccio è completata, il magnete verso l’interno sta più in basso di quello verso l’esterno, e produce una forza minore rispetto al magnete esterno. In questo modo è possibile bilanciare la pressione della puntina sui due lati del solco dal principio alla fine del disco; si ottiene un migliore tracciamento, e questo comporta una minore distorsione. Con le incisioni monofoniche il suono è localizzato al centro fra i due diffusori, questo rende superfluo ricorrere a testine mono per i dischi mono. Con le incisioni stereo l’immagine stereo è stabile e focalizzata, i dettagli sono rivelati con accuratezza, la dinamica non è compressa.